Established in 2003, our boutique blends fresh cut flowers with charming and unique gift items, providing delivery service to homes and businesses throughout the Los Angeles area. Whether you need a gift for a dinner party, anniversary, or a “just because” moment—we offer a wide variety of wonderful items to choose from including candles, purses, jewelry, books, vintage items and more. 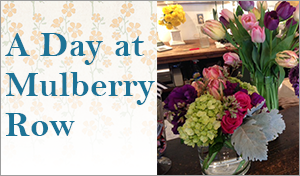 See why LA Weekly, Ventura Magazine, and others have named Mulberry Row among the best florists in Los Angeles.